My girl has her b-day. She is fond of dolls and fond of backpacks. So, I am making her a baby-doll carrier. She has got to like that! One of my friends’ kids has one, and it is handmade. First time I saw it I thought it was from a store, that’s how great it looked. I like to learn from the best and I got a head-start because I got her pattern and some advice on how to go about it. So, as I set out to make this I wanted to make it from materials that I already owned. If you look closely to the original, this is the purple with yellow one, you will see that this fabric is more heavy/sturdy. It looks more like the grown-up baby-carriers. I want to work with my scraps but if you have more thick material go for the thicker version. For the closures and straps, I found out I had a few from a suitcase that I had to throw away a while ago. I do not have enough for the entire length but with the pattern of the fabric that I have chosen I think it works well enough. selected scraps and recycled closures. With this carrier the difficult part is just to establish the order in which to sew everything. You could do the following. 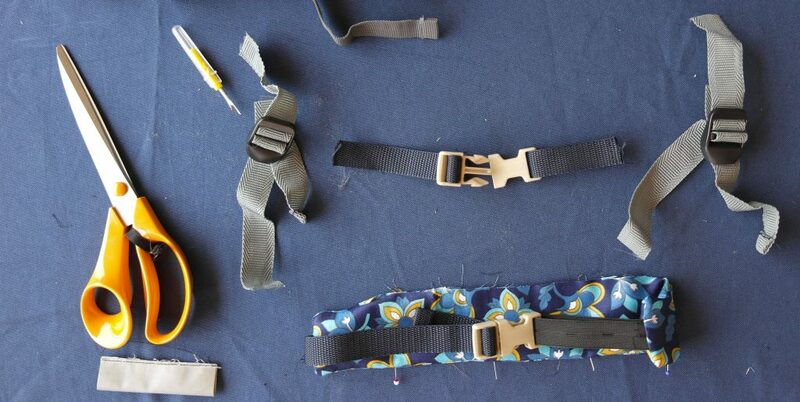 Start by making the straps. 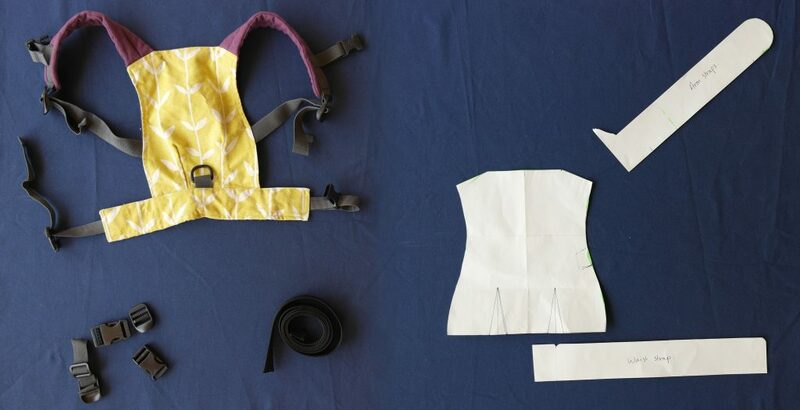 After the straps you should make the fabric parts, first the shoulder part than the back part and lower back part. Try to make the straps in such a way that both close in the same way. 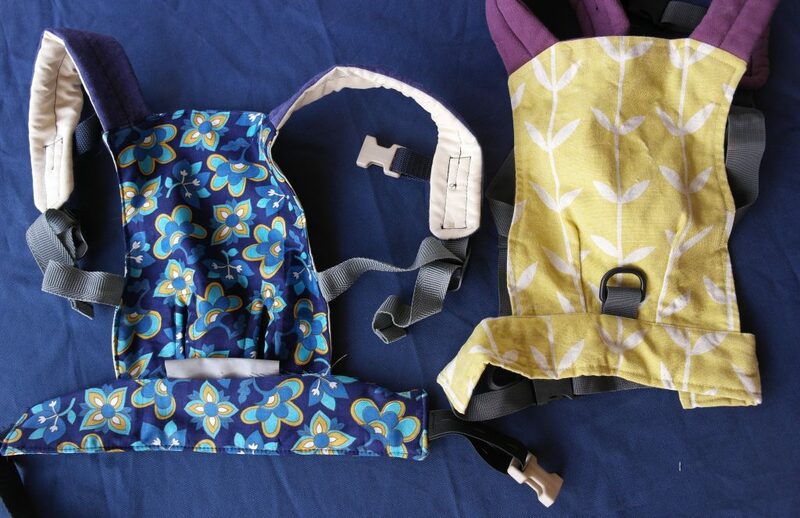 Pull the straps through the closures and fix them as much as possible, which makes it easier to attach later. After that you can start with the shoulder parts. It looks great if you line them with something that is a bit thicker. No need to have stuffing or anything like that. I used some sweat, you could probably also use some towelling. After you made these parts pin them on one part of the back panel, so you can sew them directly into the fabric when you are ready to start making that part. 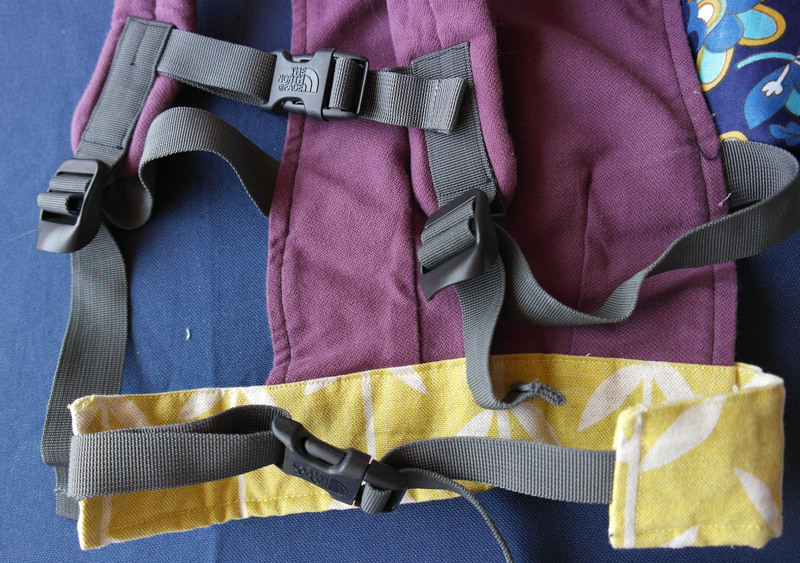 At this time I forgot to pin the straps that come from the side of the back panel. It was no big problem to attach them later, but off course it is easier if you do it the right way. Hmm, better luck next time! 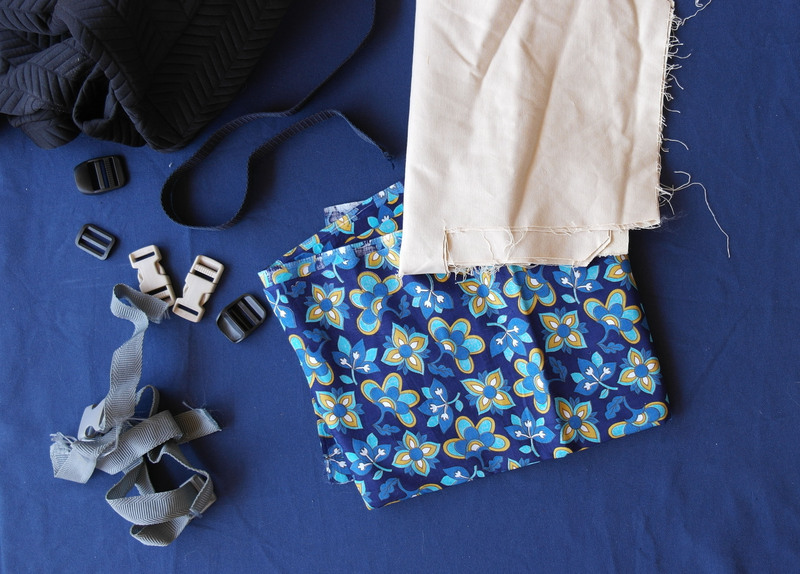 At the moment you still have a top and a bottom part of the baby-doll-carrier, you should consider to do some topstitching. This will make the backpack look nicely finished. Just a few millimetres from the edge. If your machine can handle it, try thicker tread! Now, please note a difference between the two backpacks. 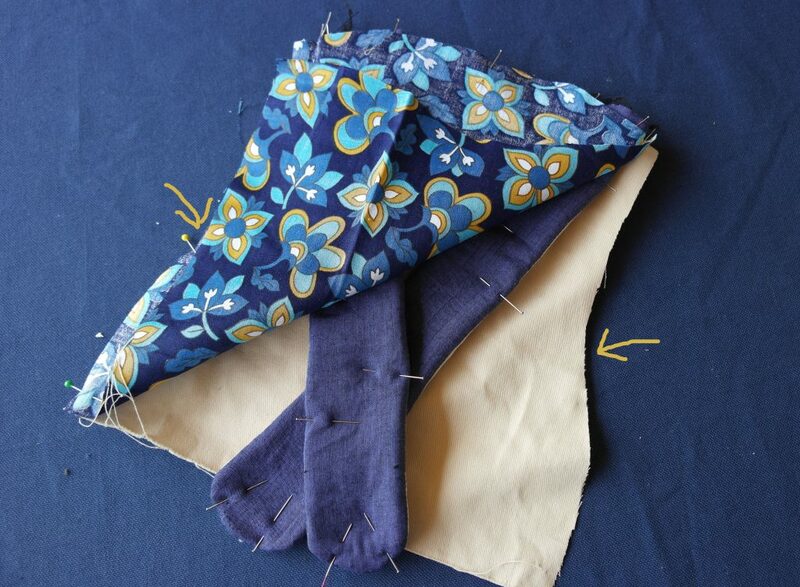 Where the original has two darts in the “bum-area” to give the sack a bit of shape, I created 2 holes. The reason is a tip given by the original maker. Real babies will be put in the backpack with their legs wide. But many dolls have rigid legs. They can’t rotate freely from the hip or bend at the knee. Meet (the backs of) teddy and doll! My friend has made a bit of fun attaching a plastic ring to the back of the doll-carrier. I had a bit of reflective tape that I attached in the final seam. Sorry kiddo, safety first! Picture before fastening the last seam. Hope you liked what I had to share, but it actually doesn’t matter because Jenna sure loved it! Posted on August 31, 2017 by Marjolein. 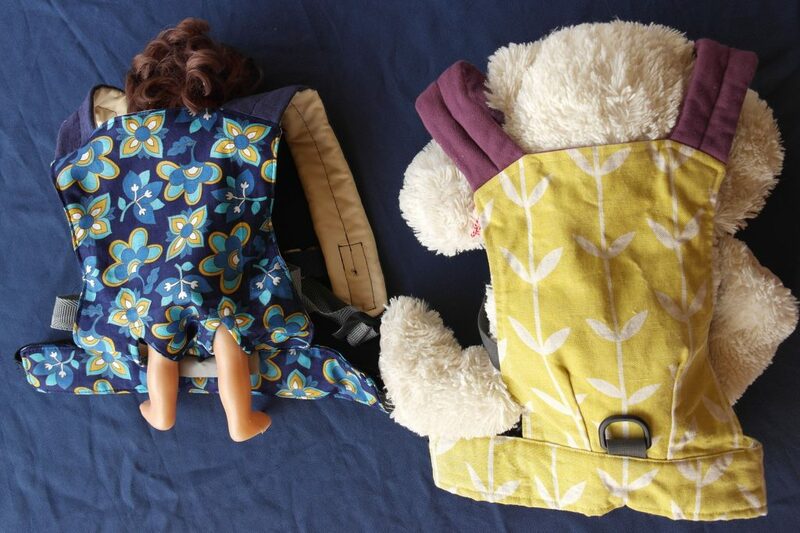 This entry was posted in Uncategorized and tagged baby-doll, baby-doll-carrier, carrier, doll, doll backpack, recycle, upcycle. Bookmark the permalink.